Obviously I’m a fan of food science and curious about the history of food and cooking in any culture. Michael Pollen’s Cooked: A Natural History of Transformation is a good read; a fascinating review of cooking origins, history, and consequences of both cooking and not cooking. 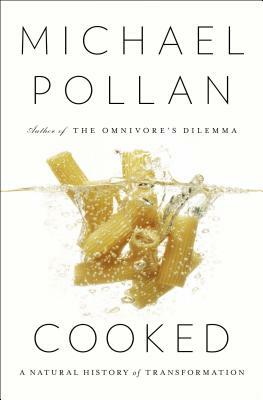 As usual, Pollen’s style makes this book easy reading, but raises interesting questions about the role of cooking in the development of Homo sapiens. The book follows Pollen as he attempts to master four cooking techniques: fire, air, water, and earth and describes the place of the cook in relation to nature and culture. He raises questions about what cooking is, what cooking does for us, and the place we have let processed food assume in our modern culture. It’s an interesting synthesis of history, food science, and archeological discoveries. The implications of NOT cooking, allowing the food processing industry to assume the role of the cook, are something we all need to consider. This is not a recipe book but it certainly increases understanding of food preparation—cooking—using heat (barbecue), air (baking), water (braising), and earth (fermentation). The links will take you to an independent book shop were you can order it in various editions—but I get nothing—it’s not affiliate marketing of anything like that. Freelance indexer and writer. Have worked on 20 indexes, both trade and scholarly, on topics ranging from gardening and cooking to history, memoir and education. Previously worked in-house for Harbour Publishing and UBC Press. Always interested in new clients. Experience and interest in the humanities, especially history, political science, human geography, literature, Asian, Chinese, Japanese, European, American, Canadian, British Columbian and West Coast studies, First Nations/Aboriginal studies, military and security studies, religious studies and peace studies, as well as trade books on food, the outdoors, travel and memoirs/biographies. My writing is mostly literary–British Columbian and religious history, fiction and personal essays–but if you need a writer, I would be interested in the right project. I also have experience, and do some freelance work in, photo research for historical books. I was responsible for the 300 photos of the book Trucking in British Columbia: An Illustrated History, by Daniel Francis (Harbour Publishing, 2012), as well as working with authors to find, organize, select and place photos for other books, such as The Uchuck Years: A West Coast Shipping Saga, by David Esson Young, and Juan de Fuca’s Strait: Voyages in the Waterway of Forgotten Dreams, by Barry Gough (both also Harbour Publishing, 2012). Hi, Anne! I’m glad you’re still doing Single Serving…I enjoy it. Haven’t read Cooked yet but have read and enjoyed others he’s written, so I’ll look for it.